Could the rest of the world finally be embracing the so-called “gross foods” of our childhood? If you grew up in an Asian household, chances are you ate pickled foods. You know, the type that smells up the whole kitchen when you open the jar. Now they are popping up everywhere, including Trader Joe’s—a sure sign that an item’s gone mainstream. One of the biggest examples? Kimchi, which not only has a deliciously spicy taste, but also has great health benefits as a fermented food. Fermented foods are active even once you eat them and are great for your digestive system. Kimchi contains healthy bacteria that help improve digestion, often leading to a healthier gut and immune system. Moreover, kimchi is low in calories and rich in vitamins, especially vitamins A, B, and C.
At this award-winning vegan food truck, the gochujang burger is made with a seitan patty base. 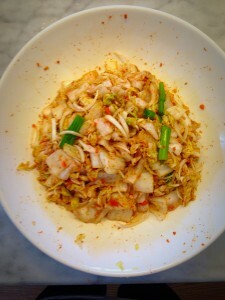 It includes kimchi, Korean chili paste, pickled daikon and leeks, and Sriracha mayo. With this truck, the founder of Kimchi Taco wanted to make Korean food accessible to the general public. All of his dishes are topped with kimchi made in-house. In addition to kimchi tacos, the menu also features kimchi nachos and spicy Korean rice gnocchi. GT Fish & Oyster sells a whopping 3,000 of these kimchi and pork buns a month! Also worth a try is the oyster po’boy slider, topped with kimchi and peanuts. Marination Mobile is a Hawaiian-Korean taco truck with lots of kimchi on the menu. If you can’t make up your mind, try their “seriously addictive” kimchi rice bowl, topped with a fried egg. Fries topped with caramelized kimchi, Korean BBQ, onions, cheese, cilantro, and “magic sauce?” Yes, please! This Korean-Mexican fusion food truck also has Korean burgers, tacos, and burritos. Choose either a beef, chicken, or veggie dog—then pick from a variety of topping combinations, many of which include kimchi. We love the Ginny, with kimchi and seaweed flakes, and the Ito, with Japanese curry and homemade kimchi apples. Even if you’re not near any of the above restaurant locations, living in the 21st century means being able to order anything your heart desires online—and kimchi is no exception. Try the artisanal versions at Mother in Law’s Kimchi, Arirang Kimchi,Mama O’s Kimchi, or Granny Choe’s Kimchi. Don’t want to buy kimchi? Whether you have time on or hands, love cooking or just want to save some money, making it yourself is an economic and fun option! It’s not a complicated process—though it might smell up your kitchen a little bit. Set aside a couple large cabbage leaves and chop up the rest into bite-sized pieces. Place the small pieces into a large bowl. Sprinkle salt over the cabbage and massage into the cabbage. Cover the bowl and leave it out for at least an hour—or up to 12—so water will be released from the cabbage. Check on your cabbage periodically. When it’s wilted and has released about 1/4 of water, drain the cabbage and set the liquid aside. Add the onions, scallion, and paste to the cabbage and mix thoroughly. Pack the kimchi into a mason jar, pushing down to avoid air pockets and leaving about an inch of space at the top. Add the liquid that was set aside earlier, pouring to cover the kimchi. Add more water if necessary. Cover the top of each jar with a large cabbage leaf saved from the beginning. Loosely seal the jars and leave out for three to five days at room temperatures. Taste periodically. Once the kimchi has a sour and spicy taste, remove the large cabbage leaves, seal tightly, and store in the fridge. Mastered kimchi making and ready for something more challenging? Try kimchi donuts, omelets, avocado quesadillas, and grilled cheese.